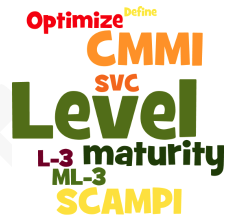 Last year, FMP embarked on an ambitious initiative to pursue a CMMI Level 3 assessment, and on October 1st, we received an email officially stating that our CMMI for Services (SVC) Maturity Level 3 (ML-3) Appraisal has been completed and that we have been rated at ML-3 using SCAMPI Methodology Definition Document, Version 1.3a. Beyond understanding that this was good news, I must admit that I was a little lost…ML-3? SCAMPI? SVC? Huh? Let’s break it down by starting at the very beginning– what the heck is CMMI anyway? CMMI stands for Capability Maturity Model Integration. It’s a process improvement training and appraisal program that was originally developed by Carnegie Mellon University in partnership with the Department of Defense. The model is comprised of five overarching levels, each of which describes the state (i.e., maturity) of a company’s processes in terms of the overarching process improvement spectrum. While CMMI has its roots in the software engineering world, it has been generalized to incorporate other areas. In fact, there are 3 primary areas, all of which use the same 5-level model outlined above. Since FMP is a management and strategic human capital consulting firm, we decided to pursue the CMMI for Services – i.e., CMMI-SVC. Ok, got it. What are the benefits of a CMMI certification for an organization? For starters, there is actually no such thing as a certification in the world of CMMI. The CMMI Institute uses the word assessment instead. Why, you ask? According to the experts, this is because the CMMI Institute does not impose the limitation of following defined principles laid down by the model or standard and allows the implementers to implement specific practices of process areas to be implemented in their own way. In other words, do your own thing, and CMMI will assess your internal process(es) in whatever form(s) they exist (Waterfall, Agile, Scrum, Lean Six, etc. ).The goal is really just to confirm that an organization has defined processes in place and that those processes are consistent. Why is this important? Particularly for small businesses, CMMI is a tangible way to demonstrate to potential customers that we have processes, procedures, and structures in place to be a successful vendor partner. CMMI provides customers an added level of assurance that vendors being awarded a piece of work will be able to complete the job on time and within budget because the company has demonstrated processes in place to successfully manage and execute the work. This is why the Federal Government takes CMMI really seriously. In fact, CMMI is a prerequisite for many government contracts, particularly in the information technology (IT) space. Process Consistency – CMMI provides an approach for standardizing processes, ensuring best practices are identified, communicated, and implemented. Cost Savings – this can come in many forms, including reducing duplicative efforts, earlier/better error detection, and increased cost predictability. Employee Development – CMMI provides a framework for teaching staff about project management and associated processes in a clear and consistent way. I’m sold! What were the major steps involved in the certification assessment process? First, we determined which projects were going to be evaluated, ultimately selecting five in total. Next, our appraiser sent us a data call, requesting a number of artifacts for each identified project (think project plans, communications plans, status reports, etc.). They reviewed all of the artifacts in excruciating detail, comparing them to the goals and standards required for ML-3, and identifying any gaps in information. For anyone going through this process, it’s important to know that there will always be a few gaps! Based on the initial assessment and gap analysis, we coordinated with various internal project managers to collect a subsequent set of artifacts, which the appraisal team reviewed to confirm the gaps had been closed. Then it was onto “show and tell.” Each FMP project manager developed a detailed briefing and delivered an oral presentation to walk the appraiser through the processes, procedures, and methodologies that we have in place to support the successful management and execution of our identified projects. Taking all of this into consideration (artifacts, gap analysis, presentations, etc. ), the appraiser made a final assessment, determining that FMP successfully meets the goals and standards for the ML-3 level. Wow, that sounds like a lot of work! What are some lessons learned from having recently led FMP through this process? Stay flexible. As evidenced by our ML-3 assessment, FMP’s processes are well-characterized, widely understood, and outlined in guides, trainings, checklists, and other tools. But, one size doesn’t necessarily fit all. In line with FMP’s core values of partnership, flexibility, and client service, there is still a need to tailor and customize these standardized processes to meet the unique needs of each particular customer. The good news is that CMMI still allows for and encourages this. Commit to the process. Given how time-consuming the assessment process is, it is absolutely critical to appoint a CMMI assessment project manager. This individual serves as the central point of contact, liaising between the CMMI appraiser and the various team members whose projects are being reviewed and evaluated. This person should be a strong project manager, who has a significant portion of his/her time available to truly manage the process end-to-end. Communicating the “why” is key. Helping everyone understand the business case for this investment as well as how it aligns with the overarching business strategy helps create buy-in and encourages those tasked with assessment-related activities to be responsive and engaged in the process. Finally, don’t forget to say thank you! It’s important to recognize that the assessment process is typically going to be an ancillary activity for staff tasked with identifying and compiling documents, developing briefings, and delivering oral presentations. It’s a ton of work, so make sure they know their efforts are appreciated. That’s great advice. How has FMP leveraged our CMMI ML-3 thus far, and what are our goals moving forward? First, our CMMI ML-3 opens a number of doors from a business development perspective. FMP’s Growth Optimization team is actively looking for contracting opportunities where a CMMI ML-3 is either required or gives us a competitive advantage. Additionally, we’re leveraging the momentum around employee development. This forum provided a fantastic opportunity for various FMP project managers to share tips, tricks, and best practices. We’re currently integrating a number of these into our ongoing Project Management brown-bag series, the goal of which is to educate FMP employees of all levels on various project management best practices, such as Financial Management 101, Managing Different Contract Types, and Managing Scope Creep. Finally, we’re focused and committed to continually improving our internal processes. Organizationally, there is a group of people that are constantly monitoring our processes improvement. This group has developed process improvement metrics and meets regularly to review/discuss these to help identify ways to increase our process efficiency and effectiveness. If you have questions or would like to learn more, please contact Nathan Bailey (nbailey@fmpconsulting.com), Tracy Compton (tcompton@fmpconsulting.com), or Ashley Agerter Raitor (aagerter@fmpconsulting.com).